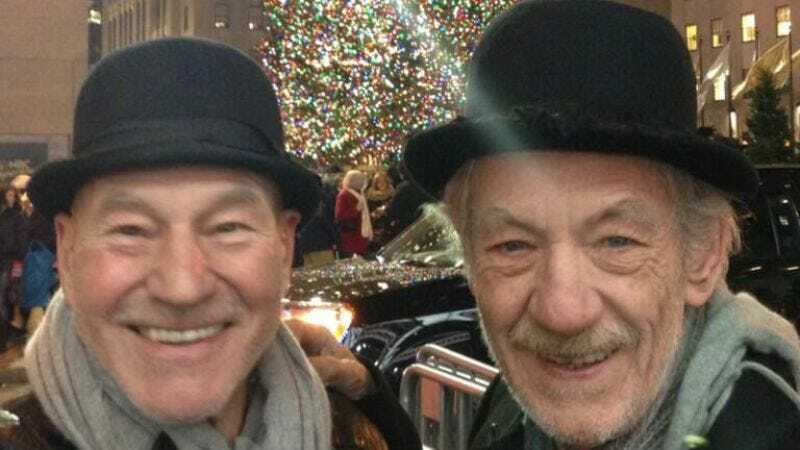 Patrick Stewart and Ian McKellen are currently co-starring in repertory productions of Samuel Beckett’s Waiting For Godot and Harold Pinter’s No Man’s Land (along with Billy Crudup and Shuler Hensley) at the Cort Theater in New York City, just a block away from Rockefeller Center. So the two well-established friends traipsed down the road to the big Christmas tree and snapped an adorable photo while wearing matching outfits complete with bowler hats. It’s not as silly as Stewart dressed as a lobster, but it’s yet another sign that these two probably have the best friendship in the world.